When it comes to personalized recommendations, Netflix is a well-known player. Browse to Netflix and the first thing you see at the homepage is content adjusted to your interests, preferences and previously watched series and movies. The banner, carousels, the order of the shows, the text and the search: everything is personalized. These “recommendations for you” are not something new or special as you might think. Indeed, Netflix is not the only one who made personalization an important part of their business strategy. However, Netflix has recently stepped up their game when it comes to personalization. By the end of 2018, Netflix announced that viewers will be able to choose the next storyline in an episode of a TV show or movie. On December 28th, Netflix released a 90-minute episode of Black Mirror: Bandersnatch. During different moments in the movie, the viewers get to decide how the story will continue. Is this the new innovative idea when it comes to customer experience and personalization? Netflix is one of the first companies that saw the potential of streaming technology. Since 2007, when the company started with a subscription video-on-demand model, the service has reached over 130 million users in 2018 (Statista, 2019). According to Gomez-Uribe & Hunt (2015) an important aspect of the service of Netflix is the recommender system. Through the recommendation systems the users of Netflix can easily find videos to watch in every session. Gorgoglione et al. (2019) argue that recommender systems are of strategic importance for online businesses. Recommendation systems refer to “web-based tools that tailor vendor’s offerings to consumers according to their preferences” (Li & Karahanna, 2015). The value of this personalized offerings can be seen in the fact that 80% of hours streamed by the customers of Netflix are determined by their recommendation algorithms (Gorgoglione et al., 2019). Since there are several kinds of recommendation engines with different performance metrics such as accuracy, novelty, diversity and trust, Netflix tries to search for the best algorithm (Gorgoglione et al., 2019. Next to this, Netflix is trying to handle issues related to the increasing number of customers and especially how to handle enormous stream of big data. One of the ideas Netflix recently incorporated, is thus a new interactive viewing experience for the users of Netflix. As this idea is not completely new and Netflix already offered this experience with children shows, the movie “Bandersnatch” is the first interactive show for adult viewers ánd the first big success within this format. Bandersnatch is a 90-minute episode of the Netflix series Black Mirror. Black Mirror is known for its critical commentary on technological developments and its impact on culture and society. In Bandersnatch, the viewers guide the protagonist Stefan through the episode by making a series of decisions (Ralph, 2019). These decisions influence Stefan’s life, experiences and mental state and result in different endings. The decisions that the viewers need to make differ from choosing between what Stefan has to eat for breakfast (Frosted Flake or Cheerios) or whether he has to jump off a balcony (Ralph, 2019). What is the value for Netflix? What is interesting about this business model is that this form of interactive experience offers new data insights for companies such as Netflix. According to Damiani (2019), Netflix uses the gathered data from the user participation to create an internal programmatic marketing infrastructure. Since the viewers need to make real-life decisions about for example their product preference (such as the choice between the cereals), musical taste and engagement with human behavior, an individual personalized pattern can be discovered. Moreover, how users handle certain decisions (for example if Stefan has to jump off the balcony) offer insight about what the viewers want out of a story and what they want to see the characters in a story do (Damiani, 2019). By analyzing this data, Netflix could even better personalize the content, but also associate products with specific content or demographics. An example that Damiani (2019) mentions is that the frosted flakes cereals could be associated with, for example, 18 to 24 years old men. This way, effective targeted advertising could take place. Another interesting part of the business model is that Netflix could work together with different brands to test their product designs. Think of the already described example of the breakfast cereal boxes as shown to the viewer with two different box covers. But what is the efficiency of the business model? What is the value for the customer? First of all, the experiences of the series are tailored to the needs and interests of the customer. Each customer has an individual and unique experience as they have to choose between different narratives. Moreover, it is interesting that in the example of Bandersnatch, the customer experiences a sense of power and control. Research have shown that increasing user experience increases user’s confidence in their ability to perform their tasks (Nysveen & Pedersen, 2004). By choosing between different options and determining how the story will unfold, the customers are in charge and can make the choices for themselves. It is interesting that the joint profitability of this business model is visible to both the customer and Netflix. With the interactive experience and thus through active customer participation and engagement, Netflix tries to uncover the hidden needs of the customers. As a result, Netflix can use this creative potential of their customers in new product and service development (Saarijärv et al., 2013). What is striking is that Netflix in fact guides the customers through different predefined choices creating the ‘illusion of free choice” (Ralph, 2019). Customers get the feeling that they are in control in the sense that they can literally determine whát and how they experience the content. Moreover, customers engage in personalized and unique experiences and eventually receive more content tailored to their preferences. Thus, through active customer participation the customers and Netflix together create greater value. However, the future will tell if this idea will pull off and will be long-lasting. Damiani, J. (2019). Black Mirror: Bandersnatch could become Netflix’s secret marketing weapon. Retrieved 23-02-2019 from https://www.theverge.com/2019/1/2/18165182/black-mirror-bandersnatch-netflix-interactive-strategy-marketing. Gomez-Uribe, C., & Hunt, N. (2015). The Netflix Recommender System: Algorithms, Business Value, and Innovation. ACM Transactions on Management Information Systems, 6(4). Gorgoglione, M., Panniello, U., & Tuzhilin, A. (2019). Recommendation strategies in personalized applications. Information & Management. Li, S., & Karahanna, E. (2015). Online recommendation systems in a B2C E-commerce context: a review and future directions. Journal of the Association for Information Systems, 16(2), 72-107. Nysveen, H., & Pedersen, P. (2004). An exploratory study of customers’ perception of company web sites offering various interactive applications: moderating effects of customers’ Internet experience. Decision Support Systems, 37(1), 137-150. Ralph, A. (2019). What Black Mirror: Bandersnatch teaches us about personalization. Retrieved 23-02-2019 from https://www.heyday.ai/what-black-mirror-bandersnatch-teaches-us-about-personalization/. Saarijärvi, H., Kannan, P., & Kuusela, H. (2013). Value co‐creation: theoretical approaches and practical implications. European Business Review, 25(1), 6-19. Statista. (2019). Retrieved 23-02-2019 from https://www.statista.com/topics/842/netflix/. M-Commerce – Creating new opportunities? Mobile commerce is growing rapidly and at a faster pace than e-commerce (Brohan, 2016). Currently, mobile commerce accounts for one third of total e-commerce sales. This percentage is expected to exceed the 50% mark soon. In other words, mobile commerce optimization is not a competitive advantage anymore, but a competitive imperative for companies (Roggio, 2016). Due to mobile commerce, you can buy everything you want, whenever you want. What would you buy via your mobile device? Do you have any wishes on your shopping list? Which one do you think I should pick ? Today is Saturday, it is sunny and warm outside. Perfect day to go shopping ! You are obviously going to spend this afternoon with your favorite side-kick. Your mission is to find the perfect outfit that will fit your shape, your personality, and evidently match your preferences. You finally find these really cool jeans, but you are still hesitant about the top : the blue and black, or the white and gold one ? The retailer comes to you and says that the jeans and the blue and black top would be the perfect match. On the other hand, your friend who has similar tastes as you – so similar you have a couple of clothes in common – votes for the second option. What would you do ? Who would you trust ? How to make sure which one is the right choice ? As a matter of fact, when you are browsing the internet, you might encounter the same problem-resolving process. They are based on the Youtube’s product network ; that is to say that they are based on the site recommendation algorithm only. These are based on the Youtube’s social network. In fact, another user marked the video you just watched as favorite, as well as another one. Therefore, the second video will be “recommended for you”. Thus, which of these videos matches users’ preferences the best ? In a study, participants were asked to watch videos on Youtube, and rate each of them from one star – Poor – to 5 stars – Awesome. One group had access to the product network only – Related-Featured videos – the second group to both product network and the social network – Dual Network – and the third group to user-generated links only – Recommended for you. The fact that the second group curve is the lowest shows that finding a liked video takes less time when using the dual network than any of the other networks. Thus, rather than proposing either one or the other, offering both at the same time gives the user more possibilities, more choice, and therefore, more opportunities to reach the right video. Therefore, the most efficient way for Youtube to satisfy its users, is to offer them as many choices as possible using different methods : the product network as well as the social network. So, next time you will go shopping and do not know what choice to make, try the clothes on in the fitting rooms ! – or buy both. Jacob Goldenberg, Gal Oestreicher-Singer, Shachar Reichman, The Quest for Content : How User-Generated Links Can Facilitate Online Exploration, Journal of Marketing Research, August 2012, 462-468, 17p. Yang Sok Kim, Ashesh Mahidadia, Paul Compton, Alfred Krzywicki, Wayne Wobcke, Xiongcai Cai, Michael Bain,People-to-People Recommendation Using Multiple Compatible Subgroups, AI 2012 : Advances in Artificial Intelligence, 2012. Searching in Choice Mode: the faster and superior way? With the rise of the internet, consumers can consider an ever growing amount of alternatives of a certain product they intend to buy. Sequentially, recommendation systems have become a widely observed phenomenon in electronic commerce. Much is known about the effect of these product recommendation on the outcome of the purchase decision of the consumer, but research now also concludes that the process of the product search is transformed in the presence of recommendation systems. EUR Professor Benedict Dellaert and Gerard Haubl from the University of Alberta explain how we traditionally approach searching for a product and how RAs transform the way we search. We trade in the well documented normative model of consumer search (i.e. Hauser & Wernerfelt, 1990), where we continue to search for additional alternatives until we believe that the potential improvement of our product selection, which the newly examined alternative might represent, does not weigh up against the effort of search we need to put in, for a model where we search in choice mode. In choice mode, we let the recommendations guide us on which alternatives to consider and we continuously compare the alternatives we have assessed among each other. Furthermore, we consider a smaller set of alternatives than we would without the RAs and consider these in more depth. 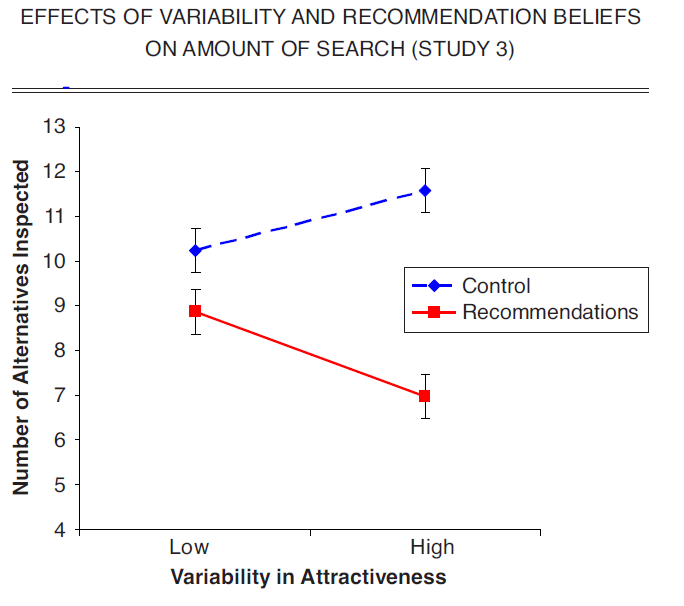 The higher the variability in the (perceived) attractiveness of the alternatives, the stronger this effect becomes, a finding that contrasts the prediction of normative search theory (see Weitzman, 1979). Luckily for us, the research indicates that the choices we make using the choice mode match our preferences a lot better than the normative model search, following the average match of 82% with the RA versus a mere 47% without the RA. On top of that, we save time as we do so. Though, there might be a fly in the ointment; more recent research from Adomavicius, Bockstedt, Curley & Zhang (2013) reports that the recommendation system can manipulate consumer preferences and can give rise to a bias. The consumer may choose for a particular alternative, because he believes that its high position on the recommendation system means that that particular alternative is a ‘correct’ answer to the uncertainty he faces. Whether that is true depends greatly on the quality of the recommendations. Also, the consumer might be biased when reporting its satisfaction with the product, as subconsciously he adapts his preferences to the product characteristics of the product bought using a recommendation system. In the end, it seems we can make truly better and more time-efficient product choices with the help of recommendation systems, on the conditions that we critically asses the quality of these systems and remain loyal to our original preferences. Adomavicius, G., Bockstedt, J. C., Curley, S. P., & Zhang, J. (2013). Do recommender systems manipulate consumer preferences? A study of anchoring effects. Information Systems Research, Vol. 24, No. 4, pp. 956-975. Dellaert, B. G.C., Häubl, G., (2012) Searching in Choice Mode: Consumer Decision Processes in Product Search with Recommendations. Journal of Marketing Research, Vol. 49, No. 2, pp. 277-288. Hauser, J.R., & Wernerfelt, B ., An Evaluation Cost Model of Consideration Sets, Journal of Consumer Research, Vol. 16, No. 4 (Mar., 1990), pp. 393-408 Weitzman, M., Optimal Search for the Best Alternative, (1979), Econometrica, Vol. 47, No. 3, pp. 641–54. Do Recommander Systems Manipulate Consumers Preferences? Recommender systems are important in the decision making. Those systems provide the customers suggestions. As a result of this, firms can better serve their customers. This will also lead to an increase in sales. Research has focused on the development and the improvement of recommender systems. But there is not quite much studied about the behavioral implications of using recommender systems. Are those recommender systems manipulating the customers? Most recommender systems use the consumers ratings items as input. Those recommendations the system provide present an expectation of how well a customer will like an item. There is also a feedback loop, those are the actual ratings of the customer after the purchase has been made. The recommendations are based on the actual ratings of a customer who already has tried this product or item. There is a possibility that people are influenced by elements in the environment when they make a decision. The first one is the anchoring issue. People are maybe consumed drawn, because the system is presenting an item to them and they choose it. It is important to know if a customer really likes it or just chooses it because it is presented in a advantageous way. It is difficult for people to see if an item is reasonable for them. It could be presented as a advantageous choice, but it will maybe be the opposite! When there is uncertainty, a customers seeks for the most plausible item. The suggested item is viewed as the ‘correct’ answer, therefore a lot of people will choose this. The users belief that the recommender system will choose the right option for them, therefore they choose what the systems presents to them. Users that will receive a high recommendation from the recommender system, will also give higher rating after they bought/used it and vice versa. What they saw as a rating, has influence on their own rating. They are biased. This is although not symmetric. There is an significant effect when the recommendation is raised, but not when the recommendation is lowered. It is notable that this effect is not only taking place when the uncertainty is high, it also operates at the point of consumption. Also is the reliability of the system important. When the system is known as reliable, the customers’ ratings will be more close to the recommendation the customer has seen before. When the system is thus less reliable, the ratings given by the customer will be less close to the recommendation. Adomavicius, G., Bockstedt, J. C., Curley, S. P., & Zhang, J. (2013). Do recommender systems manipulate consumer preferences? A study of anchoring effects. Information Systems Research, 24(4), 956-975. Cosley D, Lam S, Albert I, Konstan JA, Riedl J (2003) Is seeing believing? How recommender interfaces affect users’ opinions. Cockton G, Korhonen P, eds., CHI 2003 Conference, Fort Lauderdale FL (ACM, New York), 585–592. Whether shopping for clothes or electronics, books or microwave food, consumers have many more options than ever before. The variety of choices today gives us a much better chance of finding something that exactly suits our needs, our personalities, our activities and our bodies. 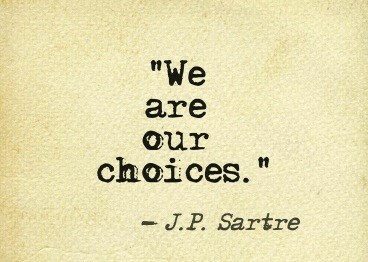 However, those choices can be overwhelming. In his book “The Paradox of Choice: Why More Is Less,” Barry Schwartz emphasizes the downside of these huge assortments. According to him, as the number of choices grows further, consumers feel overloaded and, as a result, choice becomes a burden rather than a freedom. However, since we (i.e. the consumers) have easier access to more and more information and alternatives, the chances that there is a product perfectly fitting our preferences exists out there. Traditionally, the rule of 80-20 was overruling all markets. The underlying idea is that 20% of the products make up 80% of the revenues.